Rory McIlroy has achieved the highest world ranking ever by a 20-year-old. The Northern Irishman jumped two places from 11th to ninth to surpass Sergio Garcia's 10th place standing as a 20-year-old in 2000. Tiger Woods remains in top spot three days after he announced he was taking an indefinite break from golf following revelations about his personal life. Woods holds a 6.66 points lead over fellow American Phil Mickelson, with Steve Stricker lying third. European Money List victor Lee Westwood is the highest placed British player in fourth. 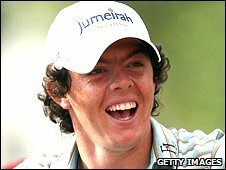 Can McIlroy win a major in 2010? Westwood recently pipped McIlroy, who has decided to compete in the US PGA Tour next season, to top spot in the European Tour end-of-season order of merit. But that did not detract from the meteoric rise in the sport by McIlroy since turning professional just over two years' ago. His victory at the Dubai Desert Classic in February was among eight top 10 finishes on the European Tour this year.